Former Moscow mayor, Yuri Luzhkov, has told the UK's Telegraph newspaper that he and his wife will not give up the fight for their "business, honor and self-worth," despite many believing the fight has already been lost. Luzhkov, a controversial figure in Russian politics, served as Moscow mayor for 18 years, and was sacked by President Dmitry Medvedev in September. The summer's killer heat burned the mayor, who was holidaying abroad as hundreds of Muscovites became seriously ill and many died from inhaling toxic peat bog smoke. But the man himself refuses to acknowledge any wrongdoing. "They asked me to go quietly. I said, ‘My term is up next year and I will go quietly then, but I do not agree to go now. You do not have any reasons to retire me.’"
Well done, presumably like the jobs he initiated, and his wife carried out, to turn Moscow from “a drab Soviet city into a modern European metropolis”. The price for this transformation, however, is seen by many as too high. Dozens of historical buildings were pulled down with ugly office buildings taking their place, parking became a nightmare and driving legendary, as the whole world talked about the unbelievable, unbearable Moscow traffic. Now, Mr Luzhkov believes his family and business are in danger – refusing to say from whom or what – but, according to the former mayor, the belief was strong enough to make him pluck his daughters out of Moscow State University and ship them off to the UK. "It was a shock for the children that we took them out of their studies here," Mr Luzhkov told the Telegraph. "For me and my wife it was a very difficult decision to make." Forbes magazine lists Luzhkov’s wife, Elena Baturina, as the third-richest woman in the world. Critics claim the once-simple factory worker could never have risen to such heights without serious help from her husband and his political allies. Those same allies are no more, however. A founding member of the country's ruling United Russia, he has quit his membership and done a quick 180-degree turn, claiming that the country was already "a collective authoritarian state" and that what little democracy existed was shrinking every day. Strangely, Mr Luzhkov never shared such opinions before, presumably in order not to rock the boat. Now that he is all at sea, he is accusing those left afloat of setting out for dry land in the form of his wife's empire. Digging his heels in, Mr Luzhkov said he will never leave the country – despite the fact many would, allegedly, love to see him go settle quietly somewhere in Europe. "I am a Muscovite, I was born in Moscow, I am a patriot of my country and it will be difficult to get rid of me. Why should I leave? Especially since it could be a gift for those in power who hate me," he said. The thinly-veiled hints at bad relations with the country's President – and much better ones with the Prime Minister – are no groundbreaking revelations either. Many have linked Luzhkov's struggle with Medvedev to the upcoming presidential elections in 2012, claiming each power figure was aiming to bring as many allies to strong positions as possible, to have more leverage come Election Day. 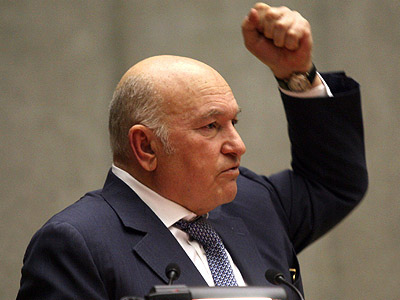 Ultimately, Luzhkov's worries, ambitions and fears seem to be all his own. Not many Muscovites care about what happens to the former mayor, as long as his controversial city management ideas are not implemented. Politicos are also likely to avoid him, for fear of showing allegiance to a man out of favor. His wife, fearing for her construction empire, will be trying to call in as many owed favors as possible, as will her husband. It leaves not too much time to visit the couple's daughters in London, let alone their own “fight for honor and self-worth” – especially if that self-worth, money-wise, seems to be harder to defend every day.